Create a “comet” using dry ice and household ingredients and use (optional) tools to observe how it models the features of a real comet. Hints for uses in your library This demonstration uses dry ice (frozen carbon dioxide). This substance is extremely cold — never touch (or allow others to touch) dry ice with bare hands, and wear eye protection. Dry ice vaporizes to form gaseous carbon dioxide. Use adequate ventilation to avoid asphyxiation and always keep dry ice in a ventilated container so that pressure does not build up. • What's in the Heart of a Comet? Is a comet currently visible in your night sky? Use the Night Sky Planner to see which objects are bright, and In the Sky to check out all of the comets! 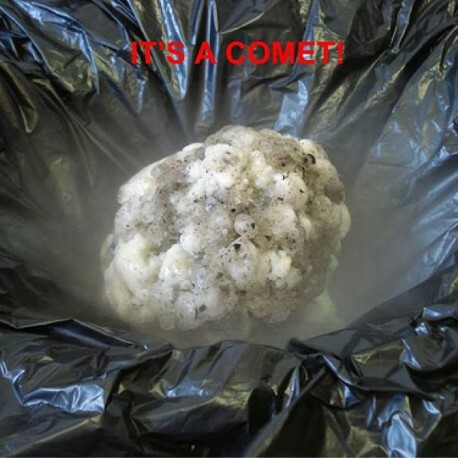 This demonstration is helpful for explaining why comets have tails as they approach the Sun. The bits of comets that fall off when they get close to the Sun are what often cause meteor showers here on Earth. When that happens, we are passing through the trail where a comet once passed. For some great activities to use with younger audiences, see NASA's Solar System Exploration site. It also talks about how the tail of a comet always points away from the Sun. We have done this for two different programs, once with teens (they LOVED it!) and once with mixed-age elementary school children at the after school program. They liked it as well, but perhaps didn't get as much from the science behind it as they were in awe of the dry ice vapors. Well-received by both groups, either way. We substituted root beer for the "simple syrup or corn syrup" part of the recipe and let participants drink some of that to balance out the fact that this was a little more hand- off of a project due to the potential hazards involved with the dry ice. We'll be doing it again this year for summer reading 2019. We did this as an activity at a librarian conference. What a great idea! Very hands-on (definitely for older kids given the dry ice). Messy and fun way to learn about comet structure.